Captains Comments: I prefer fishing as shallow of water as the tide allows. This could be anywhere from 20 to 200 feet of water. I'm also not afraid of those bigger tides. They push fish around and release more scent into the water so those big fish can follow the scent trail to your hook. 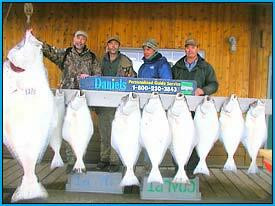 Click here for more information about Halibut. 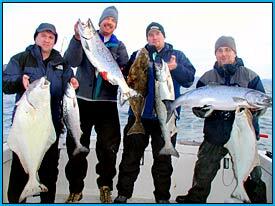 Captains Comments: Salmon fishing is one of my specialties and I have been catching these fish since I was a kid. In the summer we are catching Feeder Kings (immature fish that are feeding) and Spawners, those fish that are returning to their rivers. I troll for King Salmon using down riggers and divers to achieve various depths. 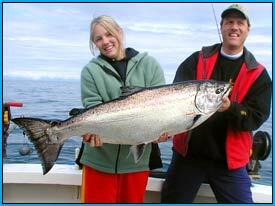 Click here for more information about King Salmon. Captains Comments: These fish are fun and feisty fish to catch. Because they are schooled up looking for their rivers there’s usually a lot of action when fishing for Silvers. They are fished in the same manner as fishing for King Salmon. 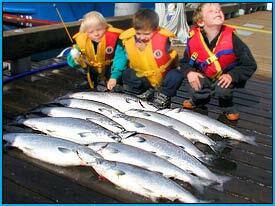 Click here for more information about Silver Salmon. Captains Comments: It’s a great trip if you’re short on time and want to try both. With the limited time given to each species it’s harder to target larger halibut and usually we’re satisfied with the good eating Halibut. There’s than a change of gear and run to the Salmon grounds where you troll for Kings or Silvers depending on the time of year. Click here for more information about Combination trips. Captains Comments: I fish for Salmon year round. Winter Kings (Feeder Kings) are up in Kachemak Bay feeding and will go back to Canada and the Pacific Northwest to spawn. They are by far the best eating Salmon you’ll ever taste (due to being immature they haven’t lost any of their fat content). I also catch Halibut incidentally while trolling. It’s a great cabin fever reliever. 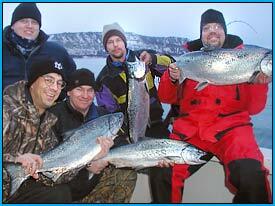 Click here for more information about Winter King fishing.